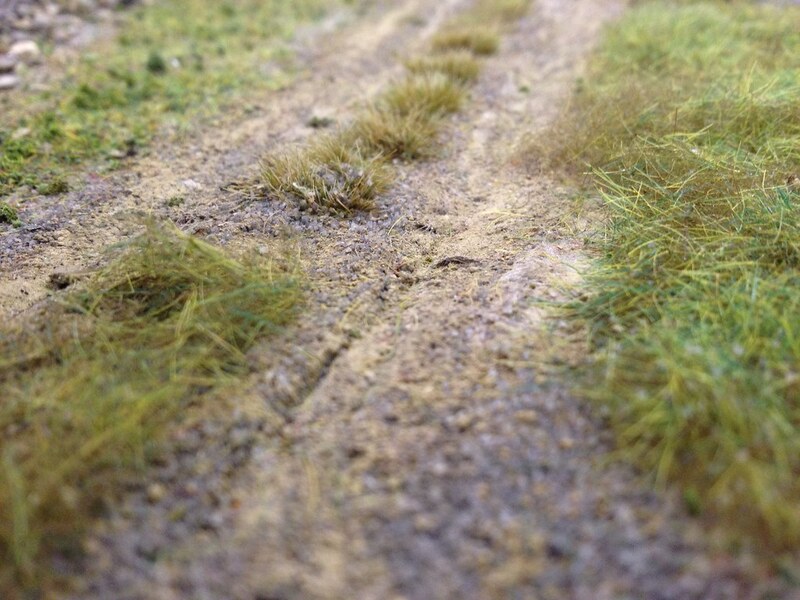 A method has been developed that should be applicable to many scales for making textured scenery in great detail with little or no glue when using a variety of basic ground covers. the modeling fibre is a composite material of fibres, paper and other recycled materials. You add the product to warm water (tint water as desired) mix well and let stand. Apply as a paste with trowel, spatula, etc. the product can be applied over wood, and foam., ceiling tiles, plaster cloth, etc. 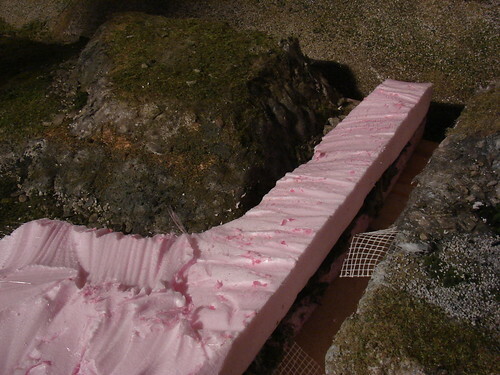 When applying over fresh foam surface (smooth) adhesive drywall tape is used to keep the paste from sliding. 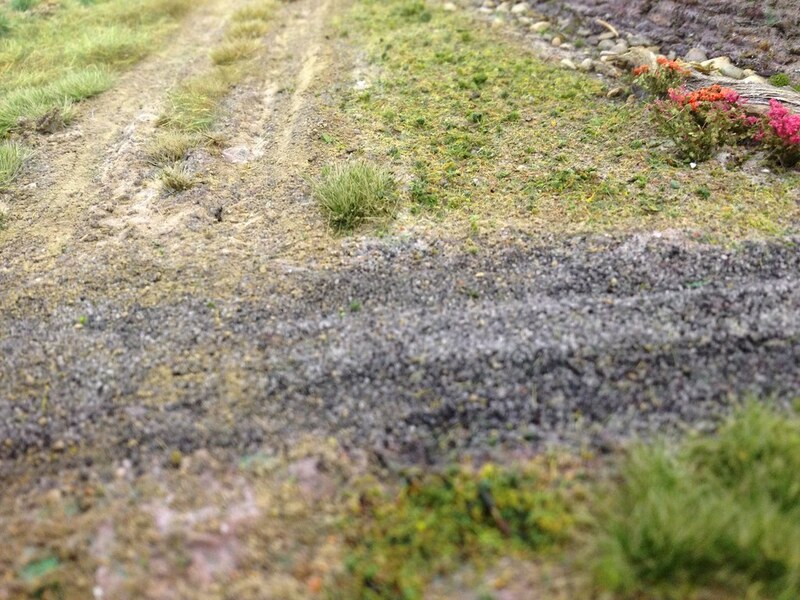 While still wet lightly sprinkle ground covers and mist with wet water. Allow to dry. Its that simple. One other thing, if you have extra stuff leftover and it dries in your container simply wet it and use it again. No waste. Apply each ground cover lightly and mist with water after two or three covers. 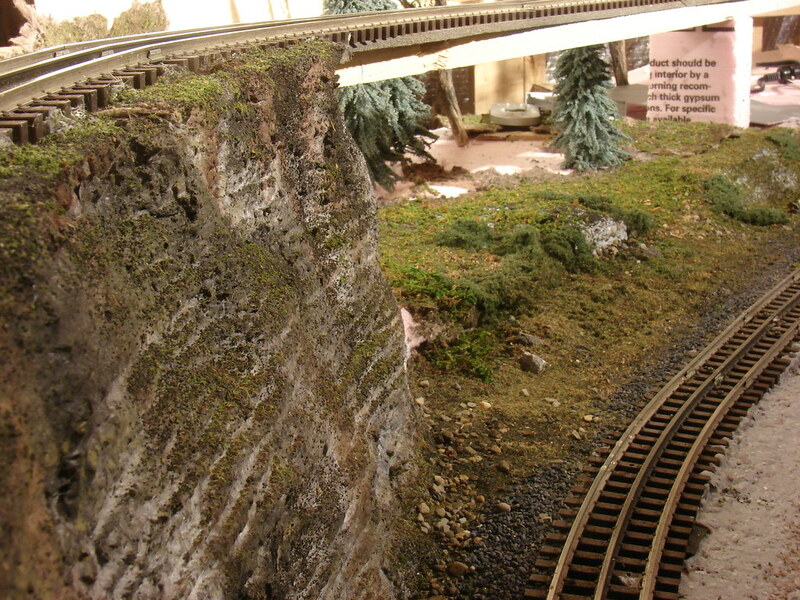 One of the nice things about the modeling fibre is how stuff like extra railroad ties are easily set into the fibre. Residential houses, etc can be set into the fibre. 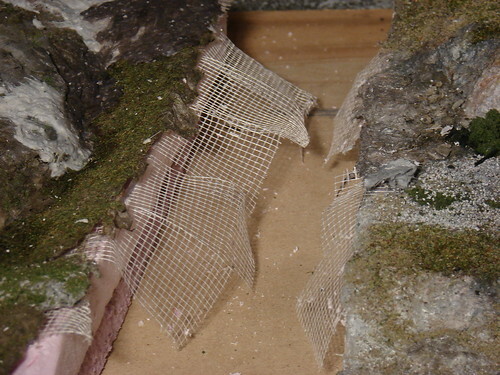 The panel below illustrates the types of ground cover that can be placed into the modeling fibre without using glue. Once dry hot glue and white glue can be used for larger objects. 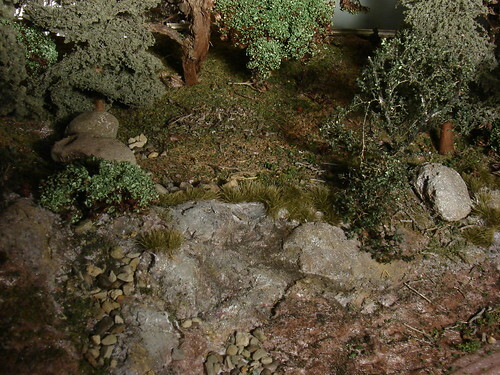 For basic ground cover often you should be able to re-wet area and add. The photo below shows some of what can be done. 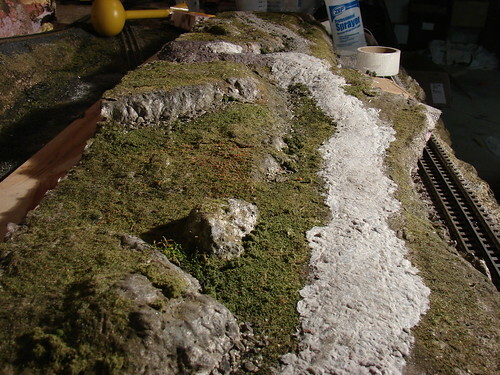 The section on left side is finished with powders or chalks then misted lightly to set. 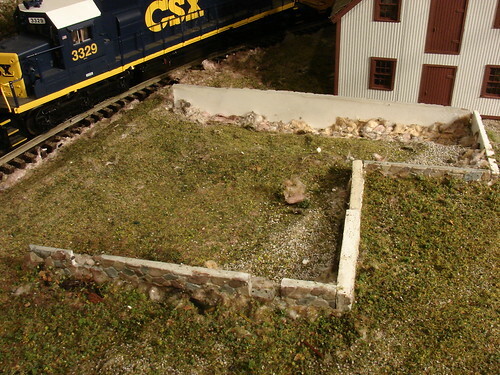 The section on right side was added later when I decided to extend retaining wall and is unfinished. Very easy to change a scene without mess. # Gives a fantastic variation in heights on my diorama's plywood base. # Does not restrict changing the scene later. 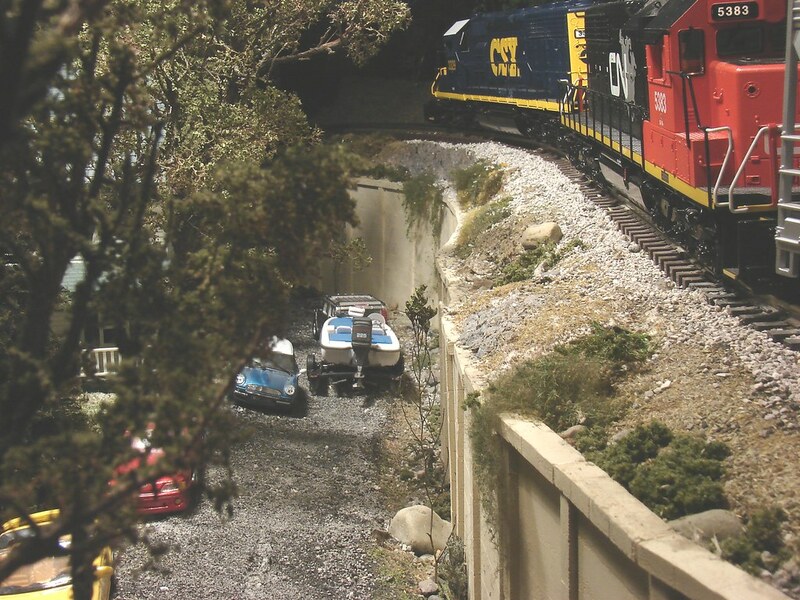 I'd even go as far as saying it is a great way to sample idea's on a particular scene." Measuring exact isn't necessary, but it is easy to add to much. Equal volumes of water and fibre is a good starting point. After adding product to water stir thoroughly then stir some more. Let it sit for 30 minutes for easiest application. We needed a lightweight mountain for our modular group so I thought I 's share the process. To keep fibre off certain areas a wet bristle type brush was used to both smooth out sections and remove material. 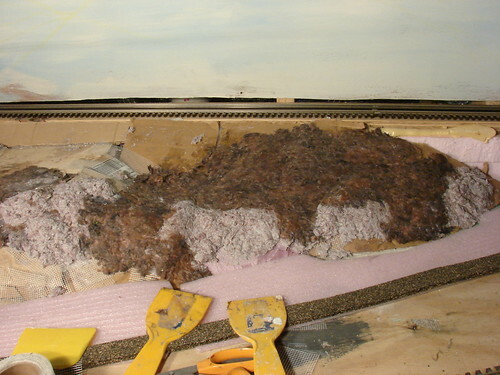 The fibre was applied directly on foam sections that were cut with hacksaw blade. 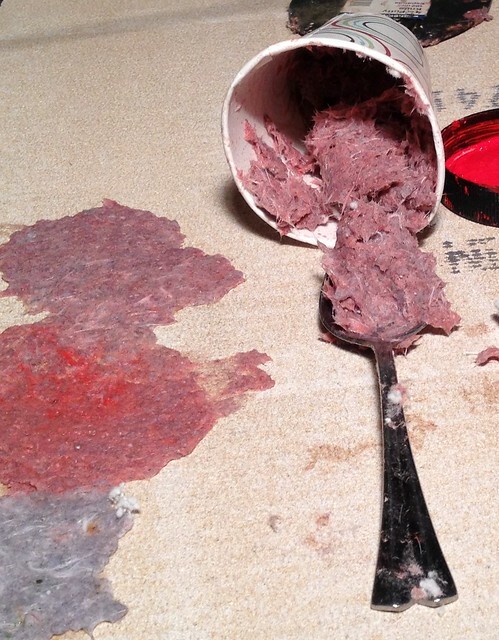 On the smooth sheen sections adhesive dry wall tape was used to give a bite. 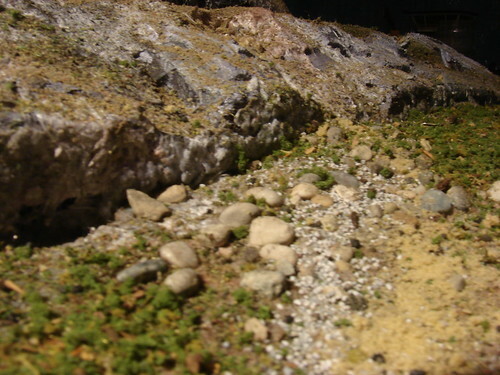 The base has a mix of larger stones, ballast and heavier ground blend (Adrirondeck) and pasture blend and light brown cover. Once dry the larger stones will be touched with some Matt Medium to secure firmly as this is going to be transported quite often. 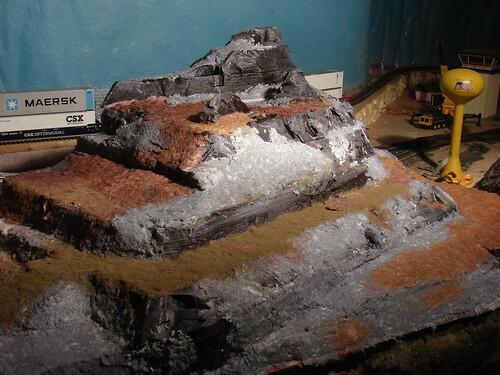 Below is the basic mountain ready for washes , dry-brushing clump foliage trees etc. Wow - the results are beautiful. Thanks very much for the in-depth tutorial! Let me know when the promotional videos are ready - if you want, I can help you get the video(s) embedded into this topic. 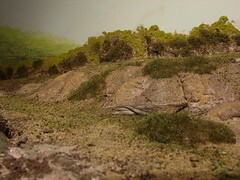 A each show we go to we do a small 3-4 sq foot section in small sections to show individuals how easy it is to devlepe textured realistic scenery in a short time without a lot of mess. To illustrate a few nice points about the product this segment shows how to easily tie together two somewhat different sections, where the height and road type need to be matched. 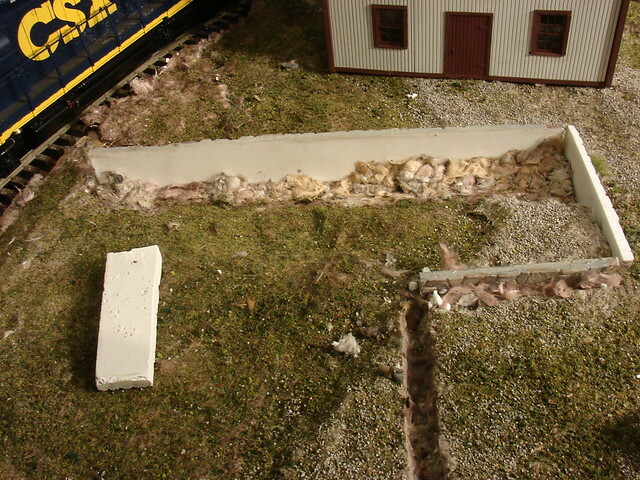 the first step was to cut a piece of foam to allow for the road to continue up a hill to the higher module made at Allentown. the next step is too peel back the dry fibre sheet (works best with the heavy body) and mesh as best as possible. It was misted lightly where real steep to soften. then took some adhesive drywall tape and made flaps. 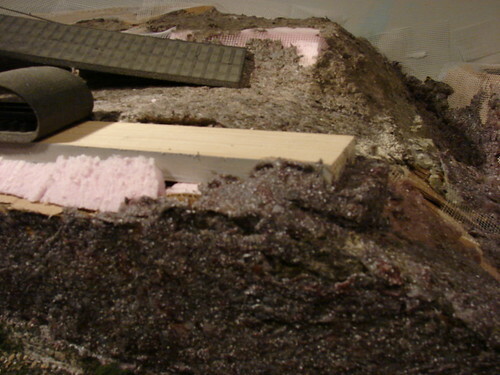 The top fibe layer was glued to the foam mesh base with a glue gun. 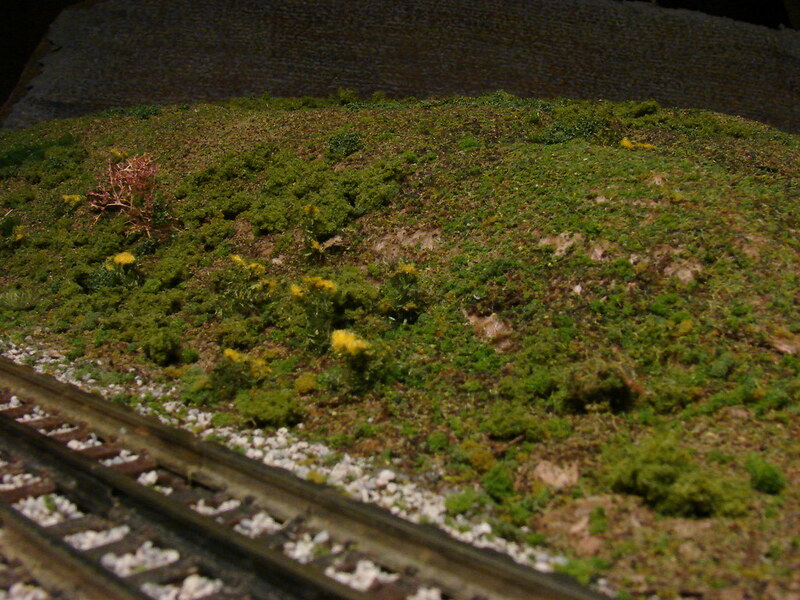 Added the ground covers , misted with wet water and allowed to dry. there are a couple of ways to use product. One is simply tint and apply to wall. After drying yo can airbrush or paint. the photo below shows the depth that you can create . This is partially painted at this point. 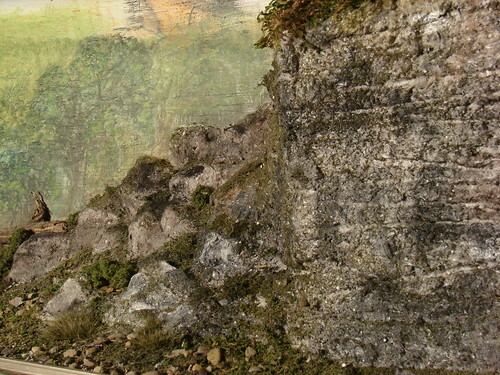 The fibre is the slightly lighter section in foreground..
One can also create a flexible backdrop using 1/8" MDF. What is nice about this is that once dry it remains flexible enough to bend around layout back without cracking. The procedure is too use adhesive drywall tape on section you want to cover, since MDF is very smooth and relatively non porous. the final version can be seen as part of our display at shows. 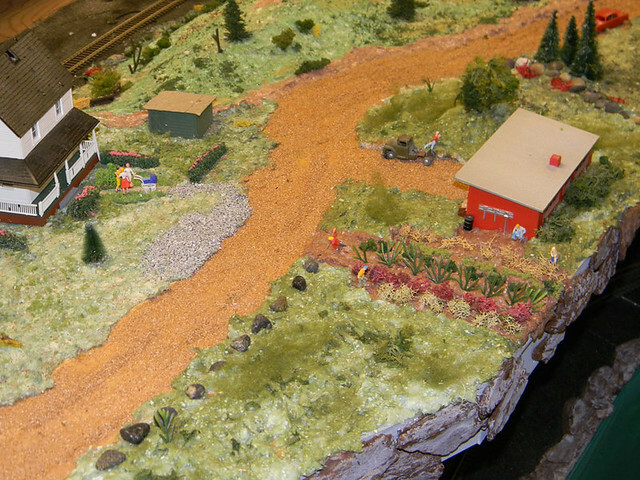 The backdrop can be easily cut and flexed to fit behind your layout. Very nice effects Bill. How easy is it to stick small trees, etc. into the True Scene Fibre? 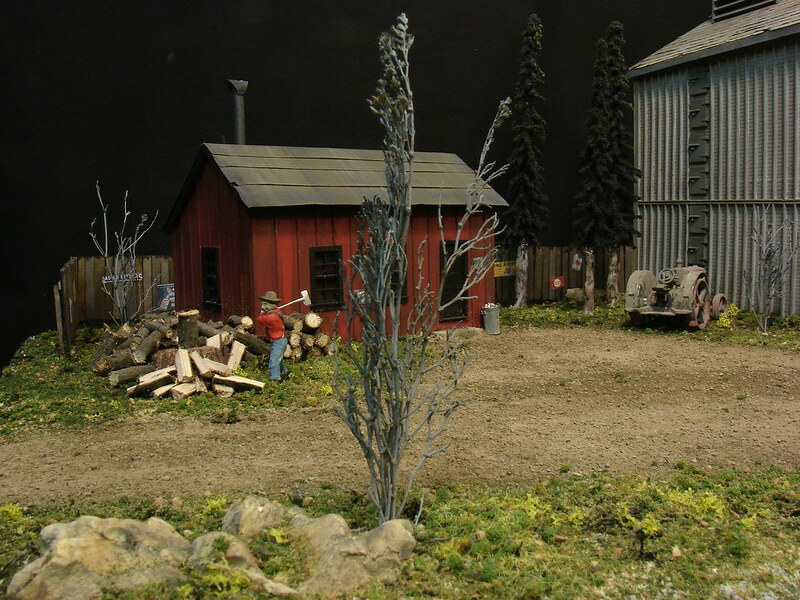 John, I use qutie a bit of "deadfall" from sweetwater scenery which is basically broker sagebrush. lay it in wet fibre. 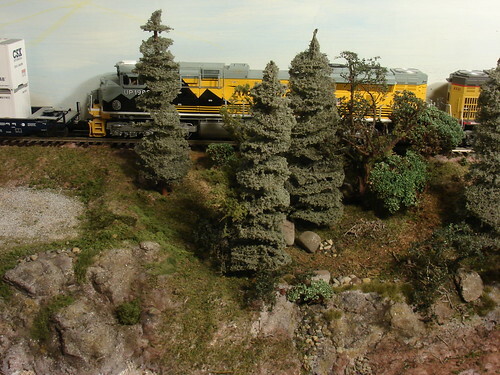 Also have used scenic express's golden rod. Use a toothpick, make little hole stick it in, and press fibre against stem (just like you plant a real bush). For synthetics like silfor, it may seem like its not going to take, but once dry it will be secure. 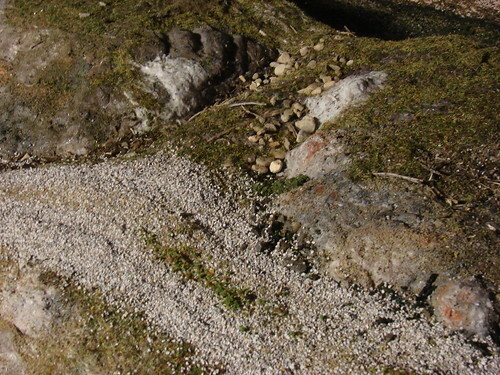 Th photo shows, stones and small stuff. 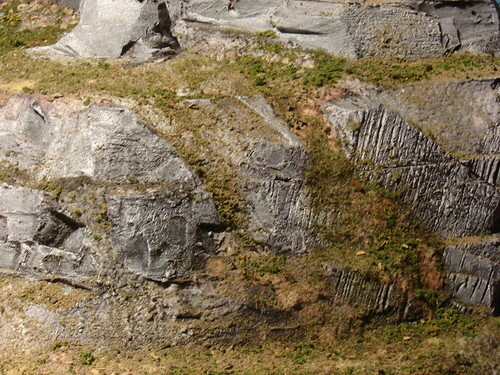 Boulders, rock cuts. The fibre applies easily as a paste on vetical surfaces and can be lumped. 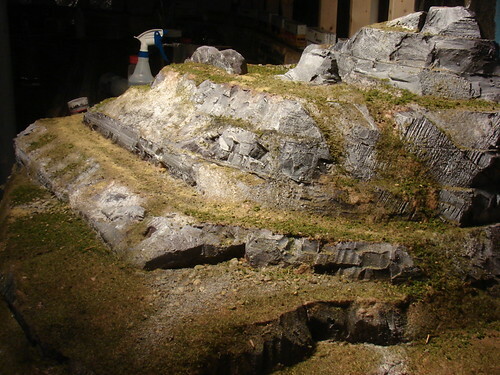 The boulders were done with modeling fibre (colorado clay) that is tinted with some grey , followed by washes of grey, burnt umber and raw siena. 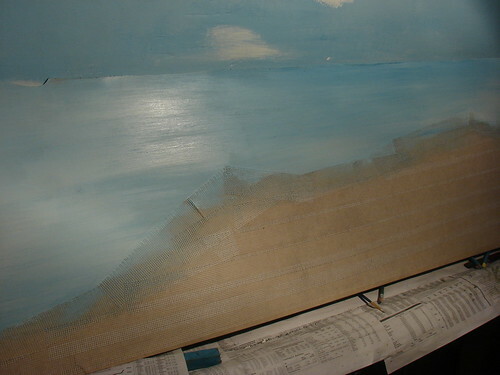 all that is left is to blend a foreground water and road to the backdrop. Took this rough area and basically shaped it while wet. No mess. For sharper rocks a small metal artist trowel with a sharp edge is used. (it was part of a 4 -paintbrush set that cost $3-4 bucks total). the lumps were shaped with trowel. Bragdon powders were used. For maximum coverage and best results apply the powders when it's rock hard. When you have the "look" mist lightly with wet water. If you mist heavily it will soften slightly and you can smooth it further and blend the powders better. 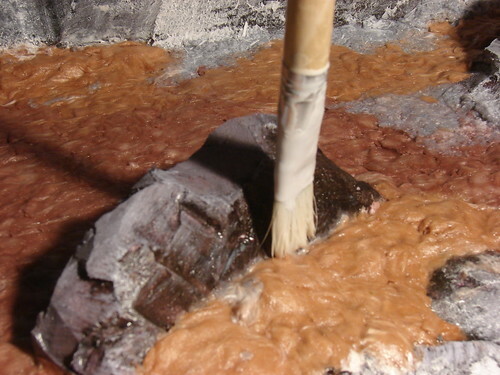 The powders used on the Colorado Clay Fibre were grey, the lighter brown, and yellow. 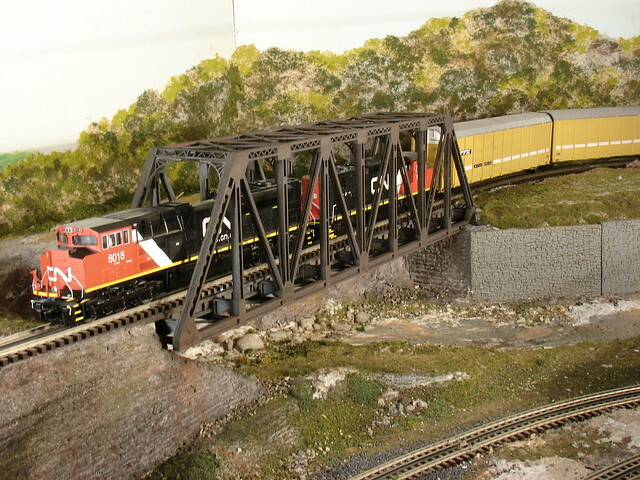 We have experimented with tinting powders from Scenic Express. To my knowledge these are concrete tinting powders. they work excellent, better then using paint. One teaspoon per 2 qts of water, add product. Allow to stand for hour, make certain there is no residual water and its like a paste then spread at your leisure. the only issue we found was that the charcoal grey actually goes more towards black at this concentration. We used the brown and the yellow clay on our bulk product. 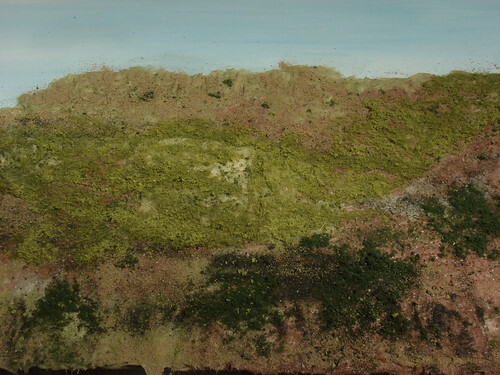 These colors are being used do to the Southern river valley. Here is one photo. The backdrop is fibre with flocking followed by misting with wet water. 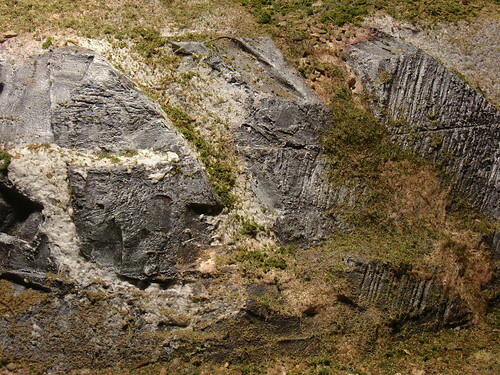 the foreground rocks is fibre lumped and carved while wet with palate knife. 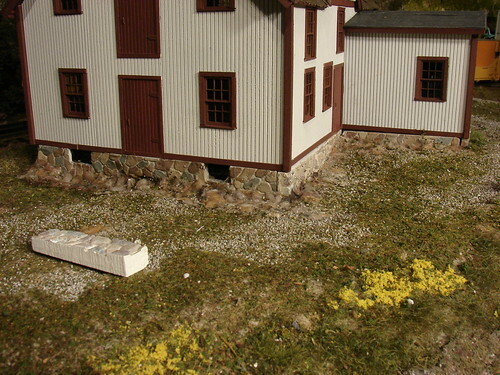 Colors were added using Bragdon weathering powders after area was completely dry. Once spread it was misted lightly with wet water. 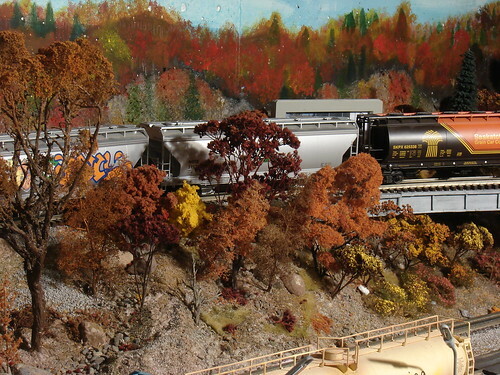 here is closeup: The goldenrod is a silfor product from scenic express. No glue and a vacuum cleaner will not pull it up. 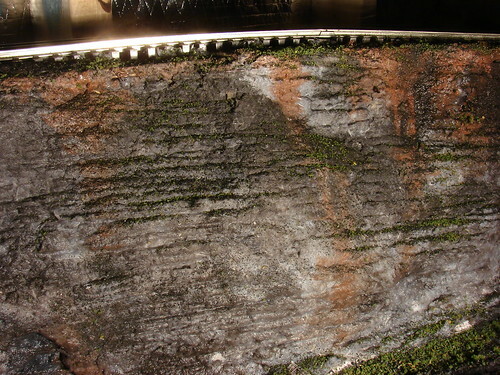 Bragdon tinting powders were used on the DRY rocky fiber areas. After done it was misted lightly to set the powders. 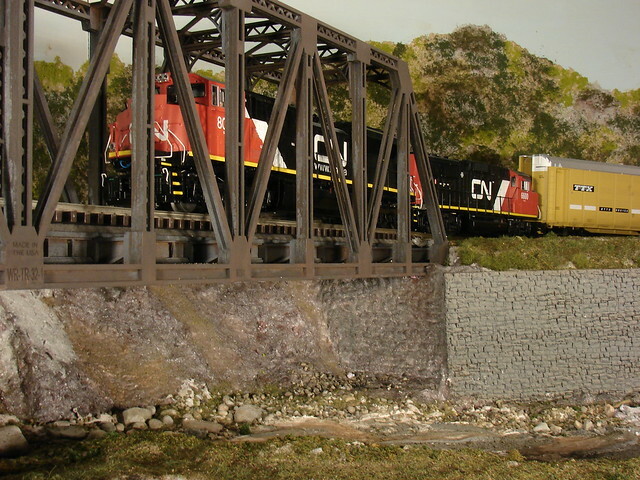 This section is being done using modeling fibre to illustrate some of the techniques of this product. 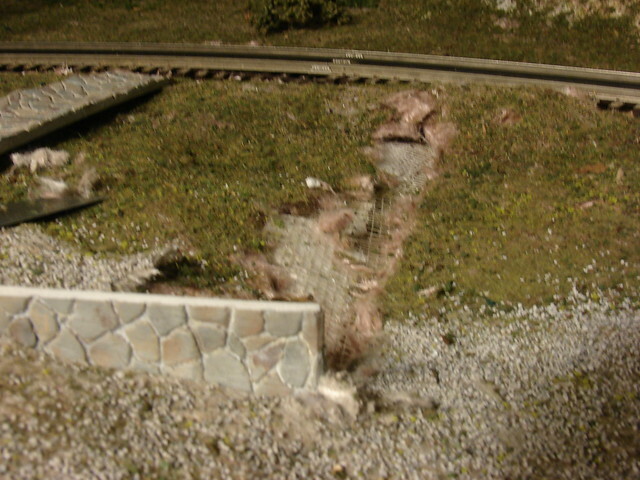 Here is the section after the rip rap (stone from scenic express) was set into wet fibre. 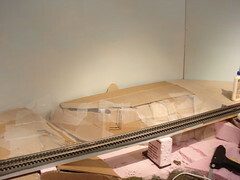 Here is photo of area from track level. The far ravine still needs detailing, flocking , bushes tress etc. The far abutement is modeling fibre. Still need to blend color with the foam stone walls from Noch. 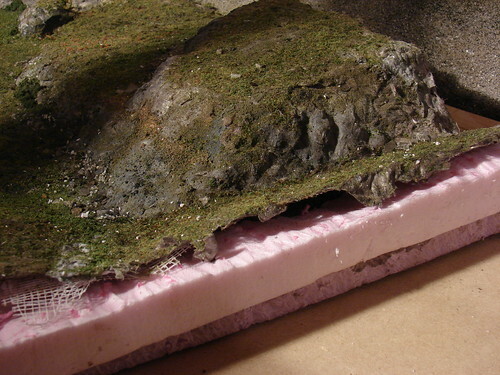 plaster was poured over foam/ fibre for resin water pour (grey/ light brown area in center). 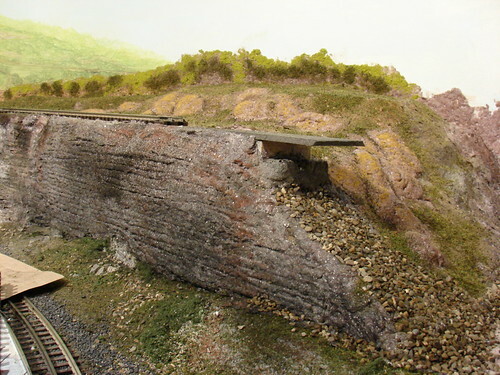 the slope under the bridge shows the dry fibre without any added detailing. 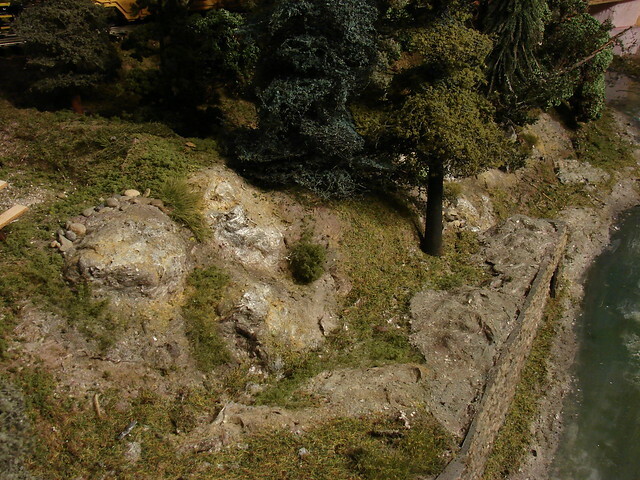 The major elements are in the scene, except for roots on some of the larger trees. 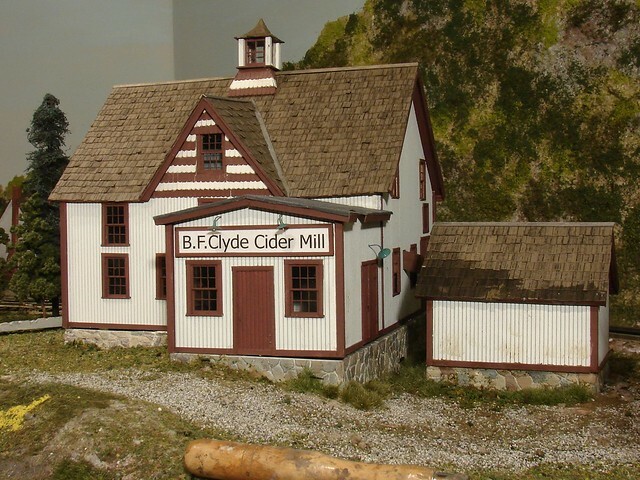 Can you tint it with Woodland Scenics green or brown pigmennts? Also is this a sculpta mold like item? Thank For the nice video. Good luck with your product will give it a try when I am ready. Here are a few more secondary roads. If you can photograph it you can make it. Many times its easy enough to bring the fiber up to the building. For this case to make things easier to work with, I wanted to keep the foundation separate from the the building. Used a razor knife to remove fiber base (set it aside) then a hot wire to dig the trench in foam and added wet fiber to the trench. Two sections of foundation were added and fiber was used to level. The base of building was guide. these two were allowed to dry before finishing the remainder. This photo shows wet fiber on outside. 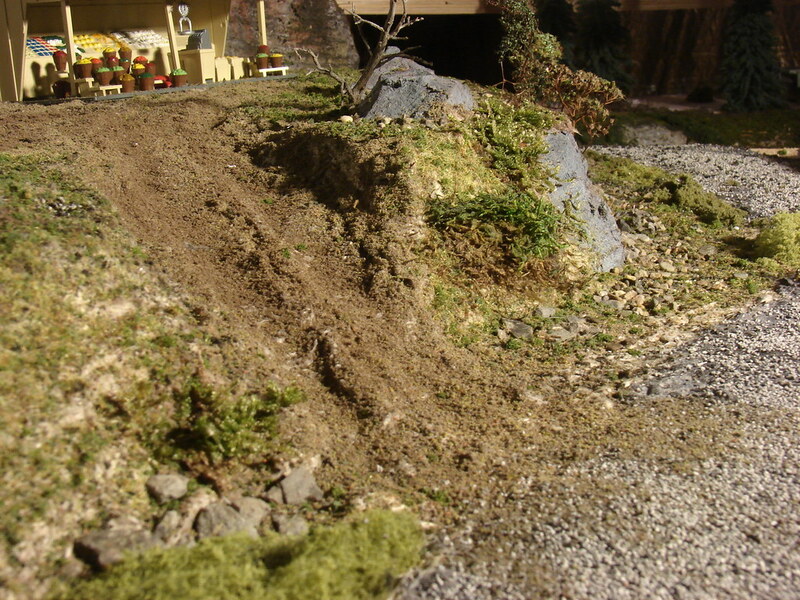 Once foundation is level (fiber is still wet) add ground covers and mist lightly. 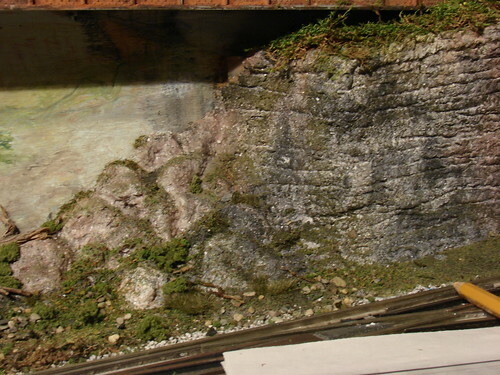 Once foundation is level (fiber is still wet) add ground covers and mist lightly. Now need to add loading docks and stairs. 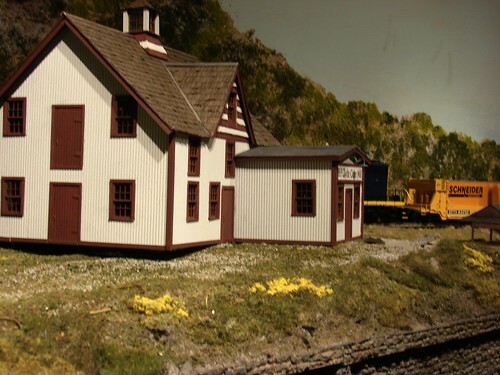 This makes it easy to weather building and add details. Once done I'll feather a bit of fiber or caulk on any spaces between foundation and structure. 50% fiber to water guideline is a function how tightly packed fiber is in the container. Often ones initial mix has too much water which substantially increases drying time and doesn't spread well. 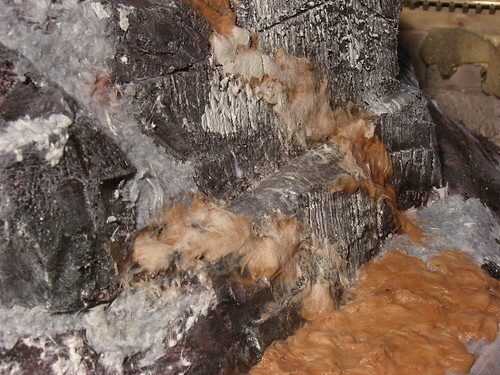 Below is a mixture of tinted fiber with proper amount of water. A good simple way to test for proper consistency is too take a teaspoon full and hold it vertical. The fiber will adhere to the teaspoon and there will be no dripping water.